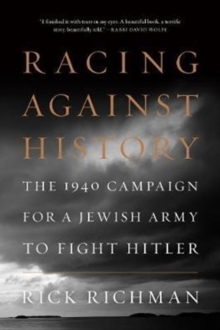 Racing Against History is the stunning story of three powerful personalities who sought in 1940 to turn the tide of history. David Ben-Gurion, Vladimir Jabotinsky, and Chaim Weizmann--the leaders of the left, right, and center of Zionism--undertook separate missions that year to America, then frozen in isolationism, to seek support for a Jewish army to fight Hitler. Their efforts were at once heroic and tragic. The book presents a portrait of three historic figures and the American Jewish community--at the beginning of the most consequential decade in modern Jewish history--and a cautionary tale about divisions within the Jewish community at a time of American isolationism. Based on previously unpublished materials, the book sheds new light on Zionism in America and the history of World War II, and it aims to stimulate discussion about the evolving relationship between Israel and American Jews, as the Jewish State approaches its 70th anniversary under the continuing threat of annihilation. A book for general readers, history buffs and academics alike, it includes 75 pages of End Notes that enable readers to pursue the stunning story in further depth.